Wi-Fi OTA upload on Mesh Nodes is not possible by the aforementioned reasons. But... HardwareSerial Bluetooth OTA is a good alternative. With HardwareSerial Bluetooth is it also possible to use a (Arduino or Termite) serial monitor to get OTA (debug) information from the Mesh Nodes . Sonoff 4 pins header, ESP8266-nn 8 pins header. 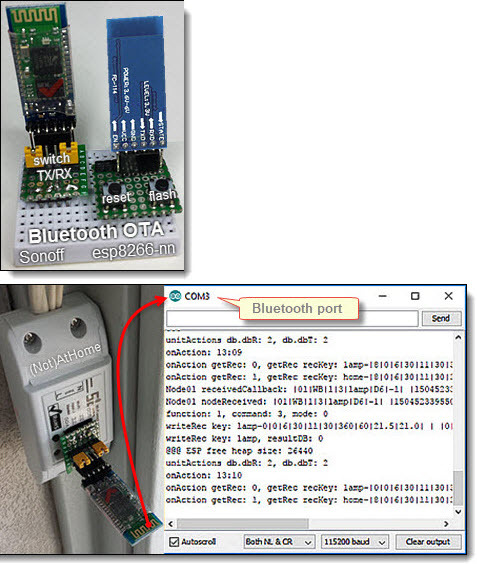 Sonoff Bluetooth OTA debug information. (as Fritzing included) You can use one Serial Bluetooth HC-05 module for all the Nodes . Setup "Serial Bluetooth HC-05" is included as helper in the sHS library.